Are money markets and capital markets the same thing? How do they work? Here are some things you must know about the two. Monica Seles was 19 years old, and the world’s top female tennis player in 1993 when a crazed Steffi Graf fan attacked her with a knife on court during a tournament in Hamburg. It forced her to go off pro tennis for two years and robbed her of potential earnings from endorsement deals and prize money, possibly totalling a few million dollars. Worse, she lost her suit against the tournament organisers, whose legal costs she had to pick up following the court’s ruling. Seles later told The New York Times that the double whammy led her to realise that one’s earnings could dry up any moment, and that the future was uncertain. That’s when the star player began tracking her investments. When the Times interview was published in February 2001, Seles owned assets worth $35 million. Of this, 44% was in stocks, 29% in tax-free bonds, 8% in real estate, and the rest in cash. In those two sentences, Monica Seles revealed her grasp of money matters. It can also serve as a lesson for people who have just stepped into the world of the financial market. A market is a place where goods, services and information are bought or sold. Similarly, a financial market is a place where one finds buyers and sellers of products of a specific nature – financial instruments like shares, bonds, insurance covers and mutual funds, among others. However, it differs from the regular marketplace on one major count: there is a market watchdog to regulate its operations. This is because the chances of fraudulent practices are higher – and of a grander scale affecting a larger number of people – in a financial market. Typically, the financial market is of two types: money market and capital market. 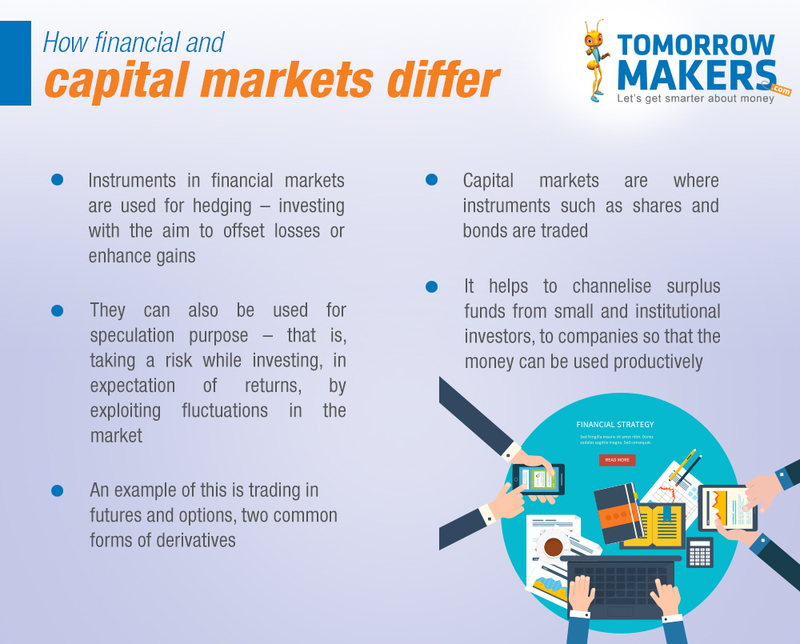 But what can be confusing at times is that the terms ‘financial market’ and ‘capital market’ are used interchangeably, though they are distinctively different. There is also a broad difference between capital markets and money markets – the first are ‘cash markets’, whereas the latter are ‘debt markets’. The investor (buyer) and issuer (seller) trade in “cash instruments” such as shares, mutual funds, derivative instruments etc. The buying and selling is done as a long-term investment, in which money is provided for a long time – for a period spanning more than a year. The capital market encompasses two broad areas: the securities market and the non-securities market. The securities market itself has two divisions. The first - primary market - consists of IPOs, bonds, book building, private placements etc. Here, companies raise funds for proposed expansions or meeting their working capital requirements by issuing shares to the public for the first time. When subscribing to an IPO, potential investors study the credibility of the promoters and feasibility of the project. Those who have invested in an IPO may not always want to hold onto their shares forever and may offload their holdings from time to time. This is what also what creates the secondary capital market, where investors sell on their shares or bonds. The secondary market consists of equity market, debt market, commodity market, futures and options market. This is where the main players are- the stock brokers, depositories (banks etc.) and custodians and clearing members, who ensure the safety of transactions. It can be further divided into spot market and forward market, the latter having two divisions: futures and options/derivatives. The regulatory body for the capital markets in India is SEBI (Securities and Exchange Board of India). This market covers mutual funds, fixed deposits, savings deposits, post office savings and insurance. However, for better understanding, the capital market is simply considered to comprise the primary market and the secondary market. Deal with debt instruments, implying one lends money to the issuing authority (government or its agencies or even companies), to meet their immediate financial requirements. As the requirement is for the immediate period, the debt is short-term in nature. This means buying and selling is done for a period of up to a year or less – for instance, from 30 days to a year. Sometimes, loans are expected to be repaid as early as overnight. The money market is often favoured by risk-averse people who are unwilling to invest their hard-earned money in fluctuating market conditions. This is where they keep their money safe in the short run, as the financial instruments here preserve the “value of money”. Also traded in the money market are securities and financial instruments with short-term maturities up to one year. T-Bills issued by the government can be both, in money markets and capital markets, depending on the maturity. 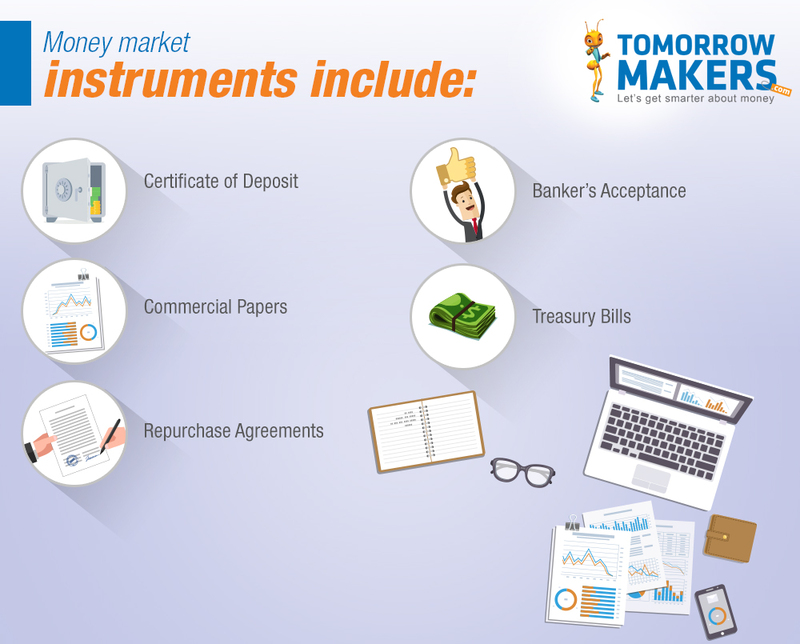 The regulatory body for the money market is the Reserve Bank of India (RBI). As explained earlier, the capital market is where capital is raised by businesses. But company stocks can be relatively high-risk instruments, and all the careful planning prior to making aninvestment, may become irrelevant if the company an investor has put money into tanks. On the bright side, if a company performs well, returns can be higher in comparison to that obtained from instruments in the form of dividends and capital appreciation. A good example of this is RelianceIndustries, after the late Dhirubhai Ambani took the IPO route way back in 1977. The money market is a mechanism that deals with the lending of short-term funds, with the borrower (including the government) raising money from the public to meet working capital or infrastructure needs. The risks associated with money markets are considered relatively low. It is a segment in which financial instruments with high liquidity and very short maturity are traded. Much like the risks, the returns from money markets are relatively low too; in the form of coupon rates (the yield paid by a fixed-income security) or interest rate. Capital markets are where fortunes and made and lost, a business around which Hollywood movies, such as ‘The Wolf of Wall Street’ are made. It is a place that entices both, the small investor and celebrities like Monica Seles. But money markets play an important role in the economy too, as they provide liquidity to governments, institutions, companies and municipalities. While capital markets are the primary engines of economic growth, money markets help governments and corporations keep the taps flowing.